It even shows a little bit about how the stamps are made and distributed. 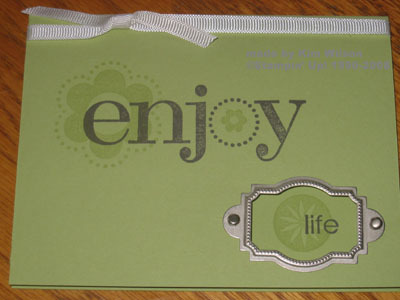 Here’s another card inspired by the Stampin’ Success magazine that demonstrators receive monthly. You can’t tell by the photo, but their is a punched out window and the word “LIFE” is on the inside of the card. Isn’t it great how the new silver Hodgepodge Hardware (occasions mini-catalog) matches several of our punches!